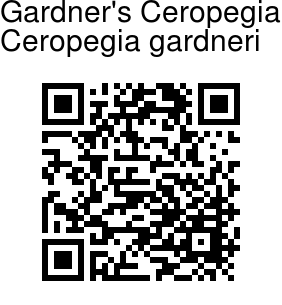 Gardner's Ceropegia is a perennial climber similar to Ceropegia elegans in having fibrous roots and 1-3 flowered cymes but differs in having linear-lanceshaped leaves, petals	sparsely fringed with hairs at tip, flower tube throughout purple within, outer corona shorter than inner and having red pollinia. Stem is about 4 m in length, hairless, branched. Leaves are simple, opposite - decussate, exstipulate, stalked; leaf-stalk 1-2.5 cm long, chanelled above, fringed with hairs along the margin and be neath; leaf lamina 3.6-8.7 x 1.0-4.5 cm, gradually decreasing in size upwards, ovate-lanceshaped, tapering at tip, rounded-pointed at base, ciliolate along margin and nerves be neath , hairless otherwise. Inflorescence is a 2-3 - flowered cyme in leaf axils. Flower-cluster-stalk is about 7 mm long, hairless, terrete; bracts 2-25 cm long, linear-subulate; flower-stalk about 1.4 cm long. Calyx 5-partite, sepals 5-6 x 1 m m, sparsely hairy along the mid - nerve, hairless otherwise, subulate. Flower 3-4.2 cm long , white, blotched with purple; flower tube 2-3 cm long , slightly curved, hairless, dilated at base, cylindrical at middle, funnel shaped at throat, stripedd with deep purple lines within, ring of downwardly directed hairs present at the mouth of dialated part of tube; hairs c. 2 m m long , unicellular conical, colourless to deep purple, flower lobes about 1.5 cm long , 1.5-2.5 cm across, fused at the tips forming ellipsoid cage, upper 1/3 rd green with purple margin, white blotched with purple veins at the middle, sparsely hairy at the tip and at the inner side, hairs 4 m m long, variously colo ured. Corona biseriate, 4 .5 x 3 .5 cm; outer corona saucer  bowl shaped, 3 x 3 .5 m m, shorter than the inner corona, with 5 bifid lobes, ciliat e within; inner corona erect, about 2.5 cm long, connivent, yellow, blotched with purple at the base, hairless. 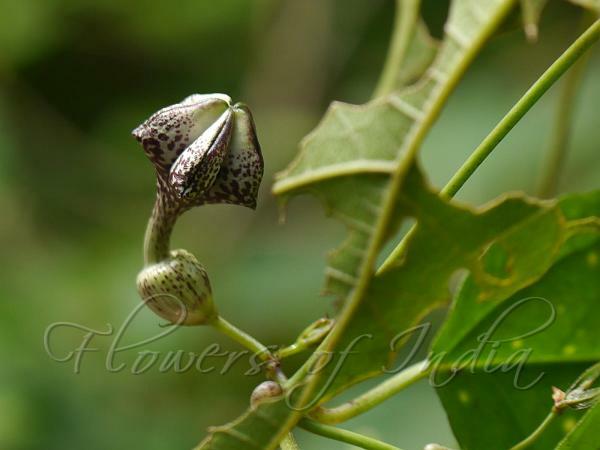 Gardner's Ceropegia was considered native to Sri Lanka, but it has recently been found in Karnataka too. Identification credit: Dinesh Valke Photographed along Bisle Ghat, Karnataka.